Federal OSHA has taken action to fix an error regarding electronic injury reporting. Employers in OSHA state plans must now file injury and illness data through the federal agency’s portal, even if their states have not adopted the Improve Tracking of Workplace Injuries and Illnesses regulation. This will affect employers in California, Maryland, Minnesota, South Carolina, Utah, Washington and Wyoming. All covered establishments must submit the information by July 1, 2018. OSHA determined that Section 18(c)(7) of the Occupational Safety and Health Act, and relevant OSHA regulations pertaining to State Plans, require all affected employers to submit injury and illness data in the Injury Tracking Application (ITA) online portal, even if the employer is covered by a State Plan that has not completed adoption of their own state rule. OSHA has informed State Plans that for Calendar Year 2017 all employers covered by State Plans will be expected to comply. An employer covered by a State Plan that has not completed adoption of a state rule must provide Form 300A data for Calendar Year 2017. There will be no retroactive requirement for employers covered by State Plans that have not adopted a state rule to submit data for Calendar Year 2016. The rule currently applies to establishments with 250 or more employees and those with 20 to 249 employees in specified industries with historically high injury and illness rates. A notice has been posted on the ITA website and related OSHA webpages informing stakeholders of the corrective action. Review the Injury Reporting Final Rule here. Visit the injury tracking application site. Download OSHA injury tracking forms. Browse injury reporting signs at ComplianceSigns.com. 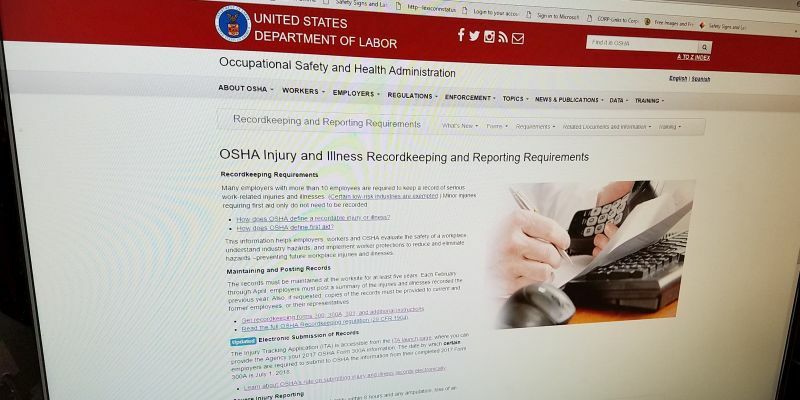 Employers in OSHA state plans must now file injury and illness data through the federal agency’s portal, even if their states have not adopted the Improve Tracking of Workplace Injuries and Illnesses regulation. Encouraging employees to report workplace injuries is essential for accurate tracking. If you have employees or contractors who don’t speak English as their primary language, bilngual safety signs make sense – and are required by OSHA. This English / Spanish Report Accidents sign makes your Emergency Response message clear to employees, visitors and inspectors.